Curcumin is a naturally occurring polyphenol isolated from Curcuma longa that has various pharmacological activities, including, anti-inflammatory, anti-oxidant and anti-cancer properties. The anticancer effect of curcumin is attributed to activation of apoptotic pathways in cancer cells, as well as inhibition of inflammation and angiogenesis in the tumour microenvironment and suppression of tumour metastasis. Angiogenesis, which is the formation of new blood vessels from pre-existing ones, is a fundamental step in tumour growth and expansion. Several reports have demonstrated that curcumin inhibits angiogenesis in a wide variety of tumour cells through the modulation of various cell signaling pathways which involve transcription factors, protein kinases, growth factors and enzymes. 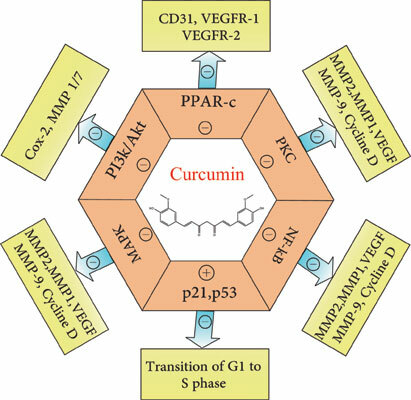 This review provides an updated summary of the various pathways and molecular targets that are regulated by curcumin to elicit its anti-angiogenic activity. Curcuminoids, neovascularization, cancer, vascular endothelial growth factor, angiogenesis, obesity.